There’s an old saying that a way to a man’s heart is through his stomach. Maybe that’s true in some cases. However, it’s definitely true that a love of good food can bring people together. I find it great fun to include food in my books. In fact, I do try to shy away from writing scenes with people gathering to eat, whether that’s at home or at a restaurant. But so many pivotal things can happen around a dining room table, while characters are sitting down to delicious dishes. And, I’m convinced good food can bring readers and writers together. 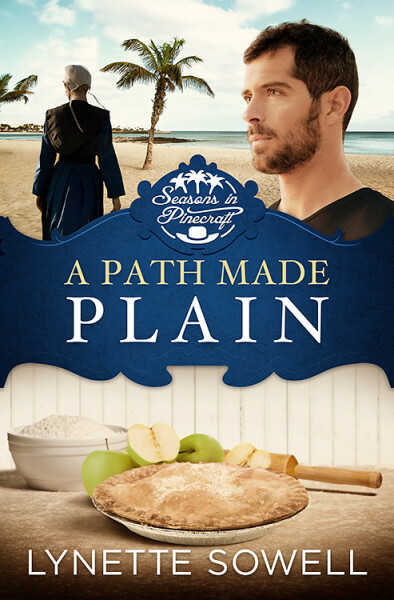 Lately, however, I’ve enjoyed writing about the food of Pinecraft, the Amish-Mennonite village in Sarasota, Florida. During my visits to Pinecraft, I’ve made sure to eat as much as the wonderful local food as possible, such as at places like Yoder’s restaurant, famous for its pies. Everything else, though, is delicious at Yoder’s, from the potato pancakes, to the meatloaf and the chicken, to their very non-Amish-sounding eggs Benedict. 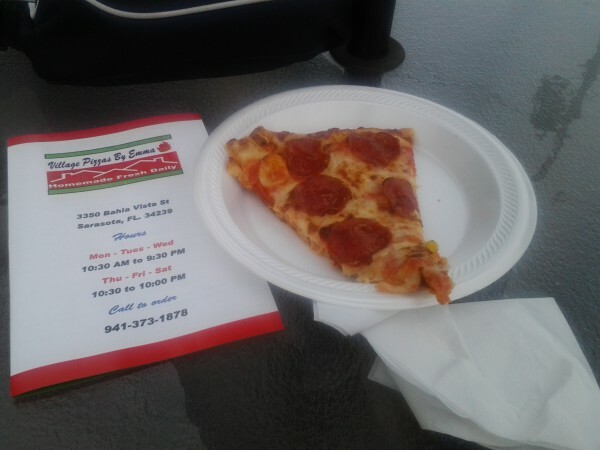 Pinecraft even has a pizza place, Village Pizzas by Emma, which is Mennonite owned and operated. My favorite at Emma’s is the classic pepperoni pizza. Last time I was in Pinecraft, as soon as I got the keys to my rental apartment and I dropped off my luggage, I hoofed it across Bahia Vista and got some of Emma’s pizza. In A Path Made Plain, the most recent book in the Seasons in Pinecraft series, the annual Pinecraft Pie Contest takes place. I set it in December to work with the time of my story, and that’s when the contest was previously held, but in 2014 was held in January. My heroine, Betsy, decides to enter her tiramisu pie in the contest. I won’t tell you if she wins or not. For my book launch party in November, we held a pie contest at my city’s public library, with a duo of local “celebrity” judges who named an overall winner, along with a fundraiser for my library where pie tasters in the crowd voted with their dollars for a people’s choice award. Winners both won a copy of the first two books in my series and a basket of kitchen gadgets. The real Pinecraft pie contest of 2015 is this Friday, January 23, in Pinecraft, so if you’re in the Sarasota area, hop on over to Everence Bank at 3047 Bahia Vista Street to check it out. The contest starts at 11 a.m. Anyone can enter the contest and everyone can taste while supplies last. Awards are given for first, second, and third place in the one crust, fruit, and cream pie categories. The competition is stiff—with past winners having surnames like Emswiler, Miller, Overholt, Troyer. What are some memorable dishes and foods you’ve read about in books? I can’t remember any specific dish, but I do like a book with food & maybe a recipe or two! Always love trying out new dishes anywhere from desserts to main dishes to anything in between! And my husband doesn’t mind being my “guinea pig”, but then again, he loves anything I cook :-) I have heard a lot about Pinecraft, FL…so I’ll have to put that on my to-visit-one-day list as well as the places you mentioned. I think visiting any Amish or Mennonite restaurant, shop or market would be such a treat! I admire their lifestyle & plain ways and I believe we could learn something from them. I wished I could attend the pie contest, what a neat experience that would be & my mouth would definitely be drooling for all the varieties sure to be there! Tough competition I bet though, lol :-) Thanks for sharing today Lynette, sure enjoyed reading your post. Blessings to you & yours!